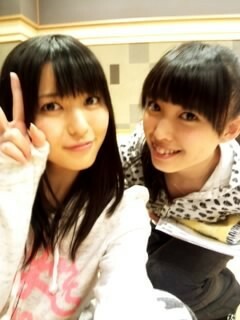 ▪℃-ute member Nakajima “Nacky” Saki shared this rehearsal 2-shot with Maimi in her blog update today. ▪℃-ute member Suzuki Airi uploaded this 2-shot of her and Maimi at rehearsal wearing the matching hoodies they received during their “Spirits” photoshoot in her update today. Posted on April 14, 2013, in Articles and tagged Nakajima Saki, Suzuki Airi, Yajima Maimi. Bookmark the permalink. Leave a comment.